2016 was a busy year - I became the Bernina UK longarm ambassador and made a prize-winning quilt, Tartan Tattoo which was successful in the UK, The Netherlands and won the World Quilt Show’s Best in Country award. A hidden quilt called Purdah, revealed in layers and a curtain made from washable sanitary pads, entitled Touch the Pickle were exhibited at Festival of Quilts, UK. Another Norse inspired quilt, Shield Maiden - made from linen and a woad dyed shawl followed in 2017 then I completed a coloured wholecloth quilt that had been marked out some time before. 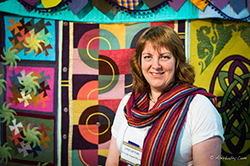 Beelzebub won the contemporary quilts category at FOQ then went on to be juried into MQX, AQS shows in Lancaster, Grand Rapids, Daytona Beach, Paducah and IQA Houston.